This article opens the black box of the remote controlled traffic light system used by public transport in Brussels. This technical device redistributes the temporal sharing of space in favour of public transport, which allows the constant erosion of the commercial speed faced by the Société de transports intercommunaux de Bruxelles (STIB) to be halted, thus cutting back on operational costs. Our objective is to make sense of this technical device and to highlight the underlying political challenges in terms of the management of space. At the heart of discussions on remote controlled traffic lights is of course the question of the respective role of public transport and cars in the context of a very high level of road congestion. We also wish to emphasise the relatively invisible work of the administration (in this case Bruxelles Mobilité) in its capacity to create compromises – with their advantages and disadvantages – so that a project is able to function within the Brussels “ecosystem”. Cet article entend ouvrir la boite noire du système de télécommande des feux utilisé par le transport public bruxellois. Ce dispositif technique redistribue le partage temporel de l’espace en faveur du transport public et est ainsi censé permettre de juguler l’effritement constant de la vitesse commerciale auquel la Société de transports intercommunaux de Bruxelles (STIB) est confrontée et, partant, de faire des économies en termes d’exploitation. Notre objectif est de rendre ce dispositif technique intelligible et de mettre en lumière les enjeux politiques qui le sous-tendent en termes de gestion de l’espace. On retrouve évidemment au cœur des discussions sur la télécommande des feux la question de la place respective du transport public et de l’automobile dans le cadre d’un niveau d’encombrement des voiries très élevé. Par cette démarche, c’est également le travail peu visible de l’administration (dans ce cas, Bruxelles Mobilité), dans sa capacité à créer des compromis, qui est mis en exergue, avec ses avantages et inconvénients, pour qu’un projet fonctionne au sein de l’« écosystème bruxellois ». Dit artikel gaat dieper in op het systeem voor verkeerslichtenbeïnvloeding waarvan het openbaar vervoer in Brussel gebruikmaakt. Deze technische voorziening zorgt voor de temporele herverdeling van het gebruik van de ruimte ten voordele van het openbaar vervoer en moet de bestendige daling van de commerciële snelheid van de voertuigen van de Maatschappij voor het Intercommunaal Vervoer te Brussel (MIVB) beteugelen en dus besparingen op de exploitatiekosten realiseren. Ons doel: deze technische voorziening toelichten en de onderliggende beleidsmatige uitdagingen op het vlak van ruimtelijk beheer onder de aandacht brengen. In de kern van alle discussies rond verkeerslichtenbeïnvloeding staat uiteraard de kwestie van de respectieve plaats van het openbaar vervoer en de auto rekening houdend met de zeer hoge verkeerscongestie. Met deze benadering willen we ook de aandacht vestigen op het weinig zichtbare werk van het bestuur (Brussel Mobiliteit in dit geval) dat erin slaagt om tot compromissen te komen, met telkens voor- en nadelen, opdat een project goed zou werken in het Brusselse “ecosysteem”. Research performed with funding from Bruxelles Mobilité within the framework of the Observatoire de la Mobilité of the Brussels-Capital Region. 1This article deals with a specific technical device: the remote controlled traffic light system used by public transport in Brussels. This device allows a redistribution of the temporal sharing of space, to be adjusted in favour of public transport. 2Thanks to our collaboration with Bruxelles Mobilité, the Brussels administration responsible for facilities and transport, in the framework of its mobility observatory, we were able to have a look “behind the scenes” at the implementation of this device, as well as explore its creation and development, through administrative documents (working notes, reports, meeting proceedings, technical documents, etc.) and the accounts of those involved in the implementation of this system (at Société des transports intercommunaux bruxellois - STIB and Bruxelles Mobilité). In addition, we read the reports of parliamentary questions on the subject, in order to understand more fully the history and the evolution. 3At the end of this research, through this article, our first aim is to advocate the socialisation of technical tools. This means that we wish to make sense of the remote controlled traffic lights technical device and the underlying political challenges, as well as make them accessible to the public debate. This is why we have entered into the rationale of the technical tool to try to understand the problems which it is supposed to resolve and the roles of the different stakeholders regarding the questions and hypotheses it raises [Barthe, 2009]. This article thus proposes to highlight the relationship between politics (in the broad sense) and technical tools, in terms of the management of space. 4Secondly, we wish to emphasise the relatively invisible work of the administration, its active role and its capacity to create compromises [Zitouni and Tellier, 2013], with their advantages and disadvantages, so that a project is able to function within the Brussels “ecosystem”. 5The improvement of the commercial speed and the regularity of public transport vehicles have constituted a major challenge for the Region and STIB for more than twenty years. These concerns are at the heart of the AVANTI programme (formerly VICOM), through which the two entities implement various measures in order to deal with them. These solutions – which are complementary – involve measures related to infrastructure (implementation of separate lanes for certain sections of tram and bus lines) and behaviour, aimed at obliging other users – mainly motorists – to respect public transport sites and stops via tickets. The third approach lies in a time-based distribution of the use of the road space in favour of public transport through the management of traffic light cycles. 6The dynamic management of traffic light cycles in Brussels is not new. It began with several pilot projects in the 1980s1 and soon captured the interest of the authorities of the new Brussels Region at the beginning of the 1990s, in a context of excitement in Europe regarding the “intelligent road”2 [Lannoy, 2001]. 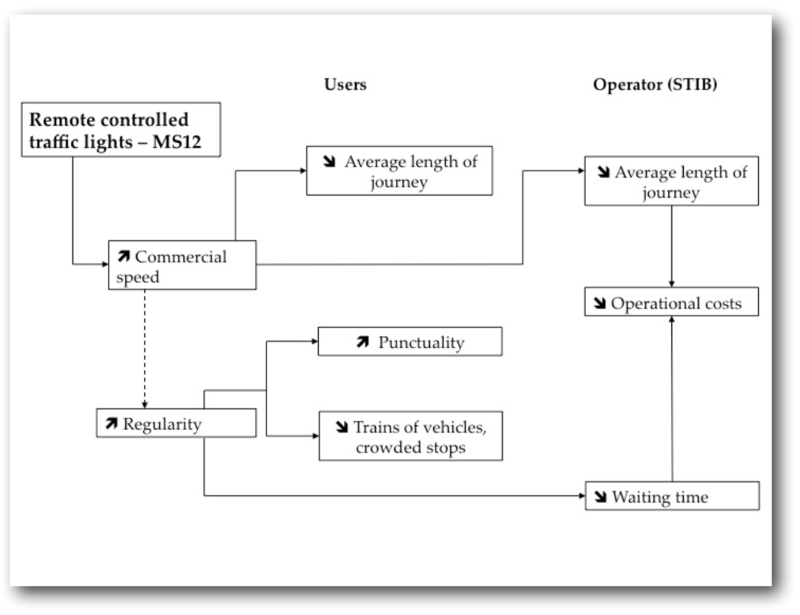 Afterwards, different mechanisms were tested until a dynamic management system (MS12) was chosen in 2006, which should be applied to all of the crossroads in the Region. At present, only STIB vehicles are concerned, but there are plans to include the other operators eventually. In the area of public transport, commercial speed refers to the speed which is “useful to the user”, i.e. the average speed of car travel. If applicable, it includes the length of stops and other reasons for slowing down. It is therefore an indicator of the performance of a network, in both economic and qualitative terms, based on the average speed of the vehicles. 3 For a detailed explanation of the functioning of the MS12 system, see Brandeleer [et al., 2016]. 4 Probability that the traffic light is green on arrival at the crossroads. 7A remote controlled traffic light system for public transport is a technical device used to favour public transport vehicles at crossroads through the shortening or lengthening of different phases of green. The MS12 management method3 is a dynamic traffic light management system, to the extent that it adapts the signals according to the detection of a public transport vehicle arriving at a crossroads. The vehicle is given relative priority, i.e. priority which guarantees a higher rate of green,4 unlike total priority, which guarantees a true 100% probability that when a public transport vehicle arrives at a crossroads it will be able to go through, to the detriment of the rest of the traffic [Furth and Muller, 2000]. The choice of this relative priority is justified by the concern that certain crossroads would be blocked and that the flow of other types of traffic (mainly that of cars) would be influenced too greatly, and also that other lines of public transport would be penalised, given the dense network in Brussels [BCR parliament, 2015]. 8In concrete terms, a public transport vehicle with an on-board transmitter sends a signal to the crossroads soon before it arrives (theoretical arrival time), as well as the details of its path and its level of priority. The priority of public transport vehicles is spread out over three levels (0 = no priority, 1 = low priority or 2 = high priority) and private vehicles have no priority. At the crossroads, the message is received by a traffic controller. This consists of a technical device which interprets the message and configures the coming traffic light phases according to the rules programmed for it which are included in a series of decision matrices (traffic light grids and priority matrices). This is of course the essence of traffic light management and the decision to give higher or lower priority to a tram or a bus. The minimum time for the green light is the time which is necessary in theory for a pedestrian to cross the road during the green phase, at a speed of 1 metre/second. There is no priority which is authorised to cut down that time. The standard time for the green light is guaranteed by default and is only cut by the request of a public transport vehicle with high priority. The first extension depends on the detection of cars or public transport vehicles but may be cut by a vehicle with higher priority (at least a low priority). The second extension takes place only at the request of a public transport vehicle with low or high priority. 10In practice, when a public transport vehicle approaches, the phases are calculated in order to allow a maximum window of green for it to go through the crossroads. In order to do this, the traffic controller may decide to add (first and second extension) or to cut certain phases (standard phase). The longer the window of green, the more likely there will be a 100% chance for STIB vehicles to go through during a green light. The length of the window is limited by the maximum length accepted for a cycle (objective to reach a maximum of 120 seconds per cycle) and the strategic importance of the crossroads in terms of car traffic. 11The arguments in favour of remote controlled traffic lights are above all technical and economic. For the user, the increase in the commercial speed results in shorter journey times, and the regularity guarantees greater punctuality, less crowding at stops and in the vehicles, a decrease in situations with “trains of vehicles” and, overall, a better opinion of the service provided. 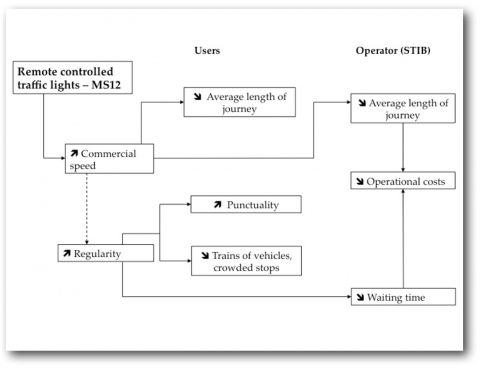 12From the operator’s point of view, it results in lower operating costs: on the one hand, by improving the commercial speed, there is a decrease in journey time and, on the other hand, the improvement in regularity allows a decrease in regulation time, or waiting time, necessary for the time coordination of the vehicle at the terminus before the next journey. In concrete terms, these gains may ensure either the same frequency with less vehicles, or an increase in the frequency with the same number of vehicles [STIB, 2003]. As an example, the installation of the MS12 system in the Luxembourg – Trois Tilleuls section of the 95 bus line allows – for this section alone on a standard day of the week (Monday, Tuesday, Thursday, Friday, except during school holidays) – an averagea gain of 0,6 minutes on the journey towards Trois Tilleuls and 1.9 minutes on the journey towards Luxembourg. It is estimated that, for this type of standard day alone, bus 95 makes 160 journeys in either direction, which represents 19 200 journeys in either direction per year (4 days times 30 weeks). Therefore, in the end, with a generic operating cost of € 100/hour, it may be estimated that for this section on a standard weekday, the remote controlled traffic light system allows a theoretical savings of € 80 000.b This applies to one line only and on certain days only. The equipment for a small crossroads (replacement of traffic controllers, etc.) costs about € 20 000. For an equipped crossroads, the reprogramming of traffic light grids costs between € 15 000 and € 30 000. In comparison, STIB estimates that a separate bus lane costs between 1 and 1,5 million euros per kilometre and that a separate tram lane costs between 10 and 15 million euros per kilometre [TRITEL, 2014]. It is not pertinent, however, to place physical developments and remote controlled traffic lights in opposition. Due to traffic congestion, the optimum use of remote controlled traffic lights is often accompanied by the development or redevelopment of roads or crossroads, as they are less efficient in unprotected sections. a Taking into consideration the hourly differentiation of time saved and the daily distribution of journeys. b Based on the internal document: “Evaluation ligne 95 : Impact télécommande des feux” [Henry, 2011]. 13Through their management contract (2007-2011), the Region and STIB had set the objective to equip 150 crossroads by 2008. This objective has since been increased through the new management contract (2013-2017), with plans to equip 450 crossroads in the BCR territory by 2015. However, at the end of 2014, only 150 crossroads were equipped and 24 were still under study. The main lines which are equipped today are the CHRONO lines (trams 3, 4 and 7), tram lines 25 and 94, and bus lines 49, 71 and 95. 14Several elements allow us to understand this delay in the implementation of the extension project for remote controlled traffic lights. 15At the beginning of the project, the regional stakeholders had to face several technical challenges specific to the tool (determination of the transmission distances for the vehicles and revision of the traffic light grids) and modernise the existing material when necessary (traffic controllers which were too old or incompatible with MS12). For the most part, these challenges have been overcome, yet there are still some failures from time to time. 16Furthermore, the efficiency of the remote controlled traffic light system is highly dependent on the exactness of the theoretical arrival times at the crossroads. When there is not enough protection from car traffic, these times soon become too random and the system may even prove to be counterproductive, to the point that at certain equipped crossroads, the system simply does not work. Separate lanes therefore constitute the ultimate complementary development for efficient remote controlled traffic lights, which in turn maximise their effect on regularity and journey time. However, overall, the configuration of on-board transmitters and traffic controllers is very sensitive to variations in car traffic and continues to require many adjustments, which delay the implementation of the system. 17An additional factor in the lack of precision with respect to arrival times at crossroads is the position of stops. The theoretical duration of each stop is estimated at 20 seconds. When the stops are positioned at the beginning of a journey, the variability in their duration – which depends mainly on passengers getting on and off of the vehicles – is carried forward to the arrival time. In the case of a longer stop, the vehicle may miss its green phase at the crossroads. In order to reduce the impact of this uncertainty on system operation as much as possible, STIB therefore recommends positioning the stops after the crossroads as soon as possible. 18Finally, the length of time for pedestrians to cross the road – which determines the minimum length of the traffic light cycle (at a speed of 1 metre per second), has an impact on the likelihood of a green light for an approaching vehicle. The shorter the crossing time, the greater the flexibility of cycles and, at the same time, the greater the likelihood that a public transport vehicle will go through quickly on a green light. A possible solution would be the development of “pedestrian islands” positioned at the centre of the road for particularly long crossings, which allows the safety time to be split. 19Nevertheless, without a drastic reduction in car traffic, the solutions to the relative inefficiency of the remote controlled traffic light system depend on the redevelopment of the public space, which, inevitably, is a long and costly process. 6 Based on our interview at Bruxelles Mobilité, 2014. 21A widely known exception with respect to the participation of the municipalities in the regional project involves the municipality of Brussels-City. This is the only municipality which manages a large number of strategic crossroads for the public transport network which has also equipped itself with a crossroads management service. Bruxelles Mobilité has sent – to no avail – takeover agreements for about thirty crossroads, and the repeated attempts to meet with the body or the deputy mayors concerned have not been successful.6 The municipality has stated its opposition in principle to remote controlled traffic lights, in particular inside the Pentagon area, where many articulated buses roam through the narrow streets. Among the main reasons mentioned by the City is the concern that the system would have too much of an impact on the other modes, in particular car traffic. If the system is applied to many crossroads, the City of Brussels would have to deal with the complaints of users, and appears to prefer a certain autonomy in this matter. Furthermore, Bruxelles Mobilité is waiting for the evaluation of the new traffic plan accompanying the pedestrianisation of the centre, which will determine the role of public transport in the centre of Brussels. 7 Based on our interview at Bruxelles Mobilité, 2014. 22Another factor in the delay of the operationalisation of the project is the significant lack of human resources in the regional administration. Until 2011, the there were only two people at Bruxelles Mobilité working on this very ambitious project. For a long time, this lack of human resources limited the development of the project to the maintenance and adaptation of traffic controllers to the MS12 system, rather than equipping new crossroads. STIB as well as the regional administration questioned the policymakers on several occasions, requesting additional staff as quickly as possible. In 2012, two more people were hired, but one of them was reassigned to other tasks in March 20147. This recurring lack of human resources also calls into question the political will to give priority to this project. 23Let us look at how the traffic light phases are determined, i.e. how the priorities and the green phase of each mode are determined and who decides. As we shall see, the management of remote controlled traffic lights is often the result of a compromise rather than a choice based only on technical imperatives. 24Five stakeholders are involved in the implementation of remote controlled traffic lights: Bruxelles Mobilité, STIB and three sub-contractors. The municipalities, the police and other STIB and Bruxelles Mobilité services (mainly concerning development, stops and transfers) have also been involved periodically. 25The implementation of remote controlled traffic lights intervenes in two cases: either it is integrated into the redevelopment planned for a crossroads involving strategic lines of public transport, or the crossroads are analysed according to priority lines determined by STIB. The latter case occurs most frequently, at the request of STIB. Equipping and programming therefore take place according to sections of lines, i.e. a series of several successive crossroads on a line. On the one hand, this allows the benefits of remote controlled traffic lights to be maximised and, on the other hand, it allows a rapid measurement of its effects in terms of regularity and commercial speed. In concrete terms, most often, when there has been a decision to equip a section or to adapt a traffic light grid (following specific requests from users or a municipality, traffic jams at crossroads, etc. ), several discussions between the sub-contractor, STIB and Bruxelles Mobilité are necessary before the approval and follow-up of the application of final grids and priority matrices by Bruxelles Mobilité. As we shall see below, the strategic decisions are negotiated during these discussions. 26Faced with the cumbersome nature of this working procedure, it is important to underline the action of the Brussels administration in terms of making the working process lighter in order to speed up the implementation of remote controlled traffic lights. Externalisation (i.e. the use of private sub-contractors) – which seemed to be an obvious fact at the beginning of the project – was gradually questioned in favour of greater control of operationalisation by the internal services of the administration. 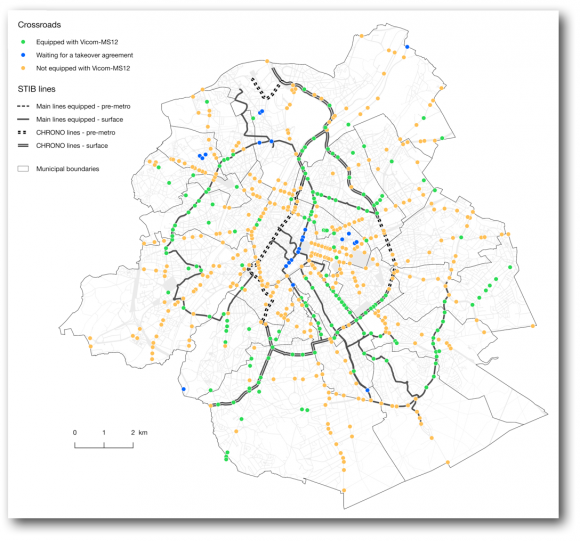 Since 2014, Bruxelles Mobilité has created its traffic light grids and priority matrices without the use of sub-contractors. 27The major component of this internalisation could be the acquisition and recent implementation (January 2014) by Bruxelles Mobilité of a new remote monitoring and management station for traffic controllers8, with the objective to have a global view in real time of the maps of traffic lights at each crossroads, to be able to diagnose dysfunctions, to facilitate data gathering at counting stations and to intervene directly in the programming of crossroads via centralised management [Bruxelles Mobilité, 2012b]. As regards remote controlled traffic lights, the station also allows the traffic light grids and matrices of the different traffic controllers to be imported or modified directly. 28The balance between the phases of the different modes is conditioned by safety (minimum time for pedestrians to cross), physical development and the density of traffic. Complaints and field observations (formation of queues or traffic jams at crossroads, technical faults, etc.) also refine the different proposed scenarios. During working meetings, each participant presents its objectives. STIB of course wishes to see the maximum level of priority granted to its vehicles, if only to respect the commitments of its management contract, but it does not want to see crossroads blocked by traffic jams and is well aware of the difficulties of the operationalisation of remote controlled traffic lights. “the system of remote controlled traffic lights functions according to the principle of “maximum priority”, and not absolute priority. During the design of traffic light plans, certain limits have been imposed on the system: no traffic light cycle longer than 120 seconds and no blocking of successive crossroads.” [BCR parliament, 2010]. The “relative” and “total” priorities in the interpretation grid by Furth and Muller [Furth and Muller, 2000] are mentioned here respectively, in less neutral terms, through the notions of “maximum” and “absolute” priorities. 30An element which explains this positioning is that the only directly visible impact of the system is perceived in a negative way. The users of public transport who gain 1 or 2 minutes with respect to their usual journey time are not likely to notice it (they will perhaps notice an improvement in punctuality, following the increase in regularity as a result of the installation of remote controlled traffic lights), but the formation of queues of motorists and the doubling of waiting times at crossroads for certain lanes are much more noticeable effects. Politicians have therefore opted for a compromise in the actual choice of the system: promote public transport without penalising the other modes (especially cars), while ensuring substantial reductions in operating costs, with respect to other solutions such as the use of separate lanes for public transport, for example. Dobruszkes and Fourneau have made the observation that “it is the culture of compromise which prevails, and the improvement of the efficiency of public transport may generally only be considered without getting in the way of car traffic” [Dobruszkes and Fourneau, 2007]. 10 Based on our interview at Bruxelles Mobilité, 2013. 31The Brussels administration is therefore caught between two traffic lights, so to speak: give priority to public transport and keep the motorists, pedestrians and cyclists happy. It attempts to allow an acceptable rate of green for all modes but points out that “we cannot fit two litres in a one-litre bottle”.10 For the administration, any traffic light plan is a compromise whereby there is an attempt to allow the maximum number of seconds for trams and buses, unless they completely block a crossroads, but this decision is not supported by politicians. 11 Based on our interview at Bruxelles Mobilité, 2014. 32Consequently, it is above all the small crossroads which are equipped and operational, and few of the strategic crossroads. Of the 60 crossroads considered as strategic by Bruxelles Mobilité, 20 were equipped with remote controlled traffic lights in 2014.11 The challenge is all the more significant since it is precisely at these major crossroads that STIB vehicles waste the most time. These crossroads are more difficult to equip than the small crossroads, mainly due to their importance in terms of car traffic. 33This is why, in order to ensure the efficiency of the system “within the limits of what is acceptable”, Bruxelles Mobilité leaves itself a lot of room for manoeuvre with respect to instructions. While the framework of “what is acceptable” seems well-defined (and even too well), the compromise between modes in the traffic light grids and priority matrices (i.e. deciding to add a few seconds of green for a mode) is established by Bruxelles Mobilité together with STIB, and through the mobilisation of strong expertise in the field (counting, complaints, observations, simulation, etc.). 34The instructions in programme documents, i.e. Plan Iris 2 and the management contract, are sometimes contradictory and cannot be applied to the letter. For example, it is impossible to favour both green waves for cars (static system, calibrated according to the speed of cars, independently of the remote controlled traffic light system) and the flow of public transport at crossroads (dynamic system which takes all modes into account while favouring public transport), and it is impossible to reduce the waiting time of pedestrians and increase their green phase (at a crossroads with at least two directions, what is given to one is taken away from the other). 35Furthermore, certain programme restrictions are simply inapplicable. The stakeholders underline that, in the field, the effect of remote controlled traffic lights can never be entirely neutral with respect to the flow, especially when it is combined with the evolution of road capacity (one less traffic lane, widening of pavements, development of separate lanes). It is therefore difficult to guarantee a theoretical rate of green of 100% for public transport without reducing the capacity of roads to just over 80% at least sometimes, for the crossroads not considered as strategic by Bruxelles Mobilité, which goes against Plan Iris 2. This is especially true given that all crossroads are different and the instructions are difficult to apply to all of them. 36This lack of clarity in the guidelines means that those in charge of remote controlled traffic lights at Bruxelles Mobilité, through their daily decisions to give or take away a few seconds to or from a mode of transportation, make important strategic choices. In short, contrary to the passive and purely executive role imagined overall, the Brussels administration has shown a certain strategic ingenuity [Tellier, 2012], by striving to bypass the abundance of rules (sometimes contradictory) to establish a compromise between stakeholders (and modes), even if it leads to sub-optimal technical and economic performance (according to the objectives of the project). This ingenuity allows it to ensure that the project does not find itself at a standstill due to contradictions in programme and political guidelines, i.e. to avoid bureaucratic dysfunction, as described by Michel Crozier (tendency towards regulatory inflation which most often leads to inertia in the system, see Crozier ). Above all, this compromise allows the tool to be adapted to (or accepted by) the Brussels “ecosystem”, so that the project functions no matter what, without the wish for a split on the part of the administration, in order for it to receive continued political support. 37But the absence of a split does not necessarily mean that there is an absence of ambition. It is interesting to note that the new specifications [Bruxelles Mobilité, 2015] for the development of 150 crossroads, published in 2015, proposes the possibility to interrupt the main direction when a public transport vehicle arrives at a crossroads (i.e. total priority), although this possibility does not yet apply. Furthermore, could the creation of a new remote monitoring and management station for traffic controllers constitute the premises of a true global tool for traffic regulation (for example, to control the capacity of entry roads into Brussels)? This is why the remote controlled traffic lights project may be perceived as a process aimed at laying the technical foundations for a future possibility [Zitouni and Tellier, 2013], even if it is currently not envisaged as such. 38In Brussels, remote controlled traffic lights were designed as a technical tool allowing the constant erosion of the commercial speed to be halted, and to cut back on operational costs. Actual savings are observed for certain lines which are relatively well protected (trams 3, 4, 7, 25). But the system is ineffective for others (line 71). Its lack of efficiency as a global solution and the accumulated delays with respect to objectives and deadlines stand out, which may be explained in various ways. 39An initial interpretation concerns the problem of car traffic. The high level of traffic congestion and its variation in time due to the uncertainty it causes with respect to the arrival time of priority vehicles, remains a vector of inefficiency of the system. The measures in the framework of the AVANTI programme aim at reducing the influence of car traffic on public transport based on the separation of modes, which gives particular focus to infrastructures, especially through the creation of separate lanes. While remote controlled traffic lights are intended to be a global facilitator of public transport traffic in the Brussels Region (the management contract provides for almost all traffic lights in the Region to be equipped and therefore, in the end, operational), and not only on STIB CHRONO lines, is it necessary for the entire network to use separate lanes in order to guarantee the smooth operation of the system? Even if it was conceivable, there are many examples to show that the congestion of the surface road network sometimes reaches levels which make the use of system counterproductive, even with separate lanes. The aim to reduce car traffic overall therefore proves to be absolutely necessary. 40A second interpretation of the difficulty to implement the MS12 system lies in the fact that initially, in the calculation of deadlines, there was no consideration of the negotiation time necessary to settle inevitable friction caused by the project within the Brussels “ecosystem” (made up of stakeholders and their own rules) as it developed, due to the strategic and political importance it takes on. This absence is echoed in the concept of the “ballistic pathology of innovation” developed by Bruno Latour , which is characterised by the belief in the self-fulfilling capacity of technical tools and suggests that once the technical principles are defined, the rest is merely application. In the case of the remote controlled traffic lights project, the system was presented [see in particular STIB, 2003] as an innovative technical device which reconciled high commercial speed for public transport and improvement of car traffic flow. A “win-win” solution, thanks to technology. In practice, the technical challenges were resolved relatively quickly, but as soon as the implementation involves a more direct interaction with the Brussels “ecosystem”, it becomes more laborious as friction is felt. 41This friction appears essentially at three levels. Firstly, each redevelopment of the public space in the framework of AVANTI is the object of many negotiations which take place as part of procedures to obtain the necessary permits, which has the effect of postponing the programming of traffic lights. Secondly, the takeover by the Region of the management of certain traffic lights managed by the municipalities is similar to the transfer of a sensitive lever for action with respect to the use of public space, and continues, as such, to lead to negotiations. Thirdly, while MS12 has been fulfilled as regards its technical operationalisation, the programming of traffic light phases – the heart of the arbitration between modes of travel within the remote controlled traffic light system – must be discussed case by case and crossroads by crossroads, between STIB and the Region, and even with certain municipalities. 43At the heart of all of these discussions is the question of the respective role of public transport and cars in the framework of a very high level of road congestion. The challenge is great, as the influence of car traffic in Brussels is such that it forces STIB to own a fleet of trams and buses which is greater than necessary to ensure the frequencies required by the demand [Dobruszkes and Fourneau, 2007]. 44As is, the tool therefore appears to contribute more to a process of “small steps” towards resolving the still urgent problem of mobility in Brussels. In this respect, the process may be seen as a continuous delay in taking clear political decisions [Barthe, 2009], and even a lack of regional ambition [Doucet, 2007] in this matter. Remote controlled traffic lights in Brussels would certainly benefit from more clarity with respect to objectives and from a clear political commitment in favour of reducing the influence of cars in the public space, with “true” priority given to public transport. BARTHE, Y., 2009. Les qualités politiques des technologies. Irréversibilité et réversibilité dans la gestion des déchets nucléaires. In : Tracés. Revue de Sciences humaines. No 12. BELGIAN ROAD RESEARCH CENTRE, 2014. Illustrated road managers’ code. BRANDELEER, C., ERMANS, T., HUBERT, M., JANSSENS, I., LANNOY, P., LOIR, C., VANDERSTRAETEN, P., 2016. Le partage de l’espace public en Région de Bruxelles-Capitale. Cahier de l’Observatoire de la mobilité de la RBC, No 5. BRUXELLES MOBILITE, 2011. Iris 2. Plan de mobilité de la Région de Bruxelles-Capitale. BRUXELLES MOBILITE, 2012. Rapport d’activités 2011. COURTOIS, X., DOBRUSZKES, F., 2008. The (in)efficiency of trams and buses in Brussels: a fine geographical analysis. In : Brussels Studies, No 20. CROZIER, M., 1963. Le phénomène bureaucratique, essai sur les tendances bureaucratiques des systèmes d’organisation modernes et sur leurs relations en France avec le système social et culturel. Paris, Editions du Seuil. DOBRUSZKES, F., FOURNEAU, Y., 2007. The direct cost and geography of Brussels mass transport’s operating delays. In : Brussels Studies, No 7, pp. 1‑19. DOUCET, I., 2007. A Vision for Brussels: Fuel to the Urban Debate or, at Last, an End to the Brussels Trauma? In : Footprint, Delft School of Design Journal, No 1, pp. 97‑105. FURTH, P.G., MULLER, T.H.J., 2000. Conditional Bus Priority at Signalized Intersections: Better Service Quality with Less Traffic Disruption. In : Transportation Research Record, No 1731, pp. 23‑30. GENARD, J.-L., 2005. Raisons techniques, raisons publiques. In : Centre de recherche architecturale de La Cambre, 2005. De la participation urbaine - la place Flagey. Les cahiers de la Cambre architecture, No 3, pp. 88‑98. HENRY, J., 2011. Rapport final de la simulation des carrefours de la ligne 55. Tritel Brussels. HUBERT, M., LEBRUN, K., HUYNEN, P., DOBRUSZKES, F., 2013. BSI synopsis. Daily mobility in Brussels: challenges, tools and priority undertakings. In : Brussels Studies, No 71. KAUFMAN, V., 2008. Les paradoxes de la mobilité. Bouger, s’enraciner. Lausanne, Presses polytechniques et universitaires romandes, collection Le Savoir Suisse. LANNOY, P., 2001. L’intelligence des feux rouges. Sociologie d’une entreprise gestionnaire. Thèse présentée en vue de l’obtention du titre de Docteur en Sociologie, Université Catholique de Louvain, Faculté des Sciences économiques, sociales et politiques Département des Sciences politiques et sociales. LATOUR, B., 1992. Aramis ou l’amour des techniques. Paris, La découverte. LATOUR, B., 2003. L’impossible métier de l’innovation technique - PROTEE une nouvelle méthode d’évaluation des projets fortement incertains. In: MUSTER, P., PENAN, H., 2003. Encyclopédie de l’innovation. Paris, Economica, pp. 9‑26. LEBRUN, K., HUBERT, M., DOBRUSZKES, F., HUYNEN, P., 2012. L’offre de transport à Bruxelles. Cahiers de l’Observatoire de la mobilité de la RBC, No 1. PARLEMENT DE LA RBC, 1997. Questions et réponses. Réunion du 20 septembre 1997, No 23. PARLEMENT DE LA RBC, 2000. Compte-rendu intégral. Séance plénière du vendredi 28 janvier 2000, No 12. PARLEMENT DE LA RBC, 2007. Compte rendu intégral. Commission de l’infrastructure, session 2006-2007, réunion du 12 octobre 2007. PARLEMENT DE LA RBC, 2010. Compte rendu intégral des interpellations et des questions orales. Commission de l’infrastructure, chargée des travaux publics et des communications, réunion du 13 mars 2010, No 67. PARLEMENT DE LA RBC, 2011. Questions et Réponses. Session du 12 décembre 2011, No 24. PARLEMENT DE LA RBC, 2013a. Questions et Réponses. Session du 15 mai 2013, No 40. PARLEMENT DE LA RBC, 2013b. Questions et Réponses. Session du 15 juin 2013, No 41. PARLEMENT DE LA RBC, 2014. Questions et Réponses. Session du 15 avril 2014, No 50. PARLEMENT DE LA RBC, 2015b. Questions et Réponses. Session du 15 octobre 2015, No 11. STERCK, A., 1993. La politique des déplacements en Région bruxelloise. In : Courrier hebdomadaire du CRISP. Vol. 1408-1409, No 23, pp. 1‑60. STIB, 2003. Feu vert aux transports publics. La télécommande des feux dans la Région de Bruxelles-Capitale. Premier Rendez-vous de progrès entre la STIB et la RBC. Bruxelles. STIB, 2007. Trams, Bus: manuel des bonnes pratiques pour un réseau performant. Bruxelles. STIB, RBC, 2013. Contrat de gestion 2013-2017 entre la Région de Bruxelles-Capitale et la société des Transports intercommunaux de Bruxelles. Bruxelles. TELLIER, C., 2012. Corps technique et techniques du corps. Sociologie des ingénieurs du souterrain bruxellois (1950-2010). Thèse de doctorat en sciences sociales et politiques, Bruxelles, Université Libre de Bruxelles. TRITEL, 2014. Étude de mobilité de, à et vers Bruxelles en 2010 et en 2040. Diagnostic 2010, Brussels. ZITOUNI, B., TELLIER, C., 2013. How the technical bodies build the city. Strategic management of time during the creation of the urban development plan in the 19th century and the underground tramway/railway in the 20th century in Brussels. In: Brussels Studies. No 64. 1 A well-known precedent in Brussels is that of remote controlled traffic lights in favour of trams on Avenue Louise when they cross the slip roads accessing the tunnels. 2 “A technical and organisational concept which defines an ideal technical system in which the two main activities related to the phenomenon of road circulation are integrated via the intermediary of information and communication technologies: the management of traffic and driving” [Lannoy, 2001: 41]. 5 This includes the municipalities of Anderlecht, Ixelles, Evere, Ganshoren, Molenbeek-Saint-Jean, Schaerbeek, Uccle and Watermael-Boitsfort. Negotiations are under way with the municipalities of Jette, Forest, Woluwe-Saint-Pierre, Woluwe-Saint-Lambert and Brussels-City [BCR parliament, 2015]. 8 As the former station was technically obsolete (the updating of traffic controllers and the management of dysfunctions had to take place on the premises), Bruxelles Mobilité issued a public invitation to tender in 2011, in order to acquire a new remote monitoring and management station for traffic controllers for all crossroads. Siemens SA was awarded the contract. The station was delivered to the administration in January 2014, for a final budget of approximately 3 million euros. 12 This ambivalent positioning at political level does not seem to be specific to Brussels and has been observed by Kaufmann, [2008: 80-85] with respect to different European cities.